Thousands died during the famine. その飢饉で何人もの人が死んだ. a fuel [coal] famine＝a famine of fuel [coal] 燃料[石炭]飢饉. Famine is caused by crop failures. 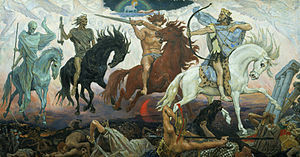 (mythology) The personification of famine, often depicted riding a black horse. A famine is a widespread scarcity of food that may apply to any faunal species. This phenomenon is usually accompanied or followed by regional malnutrition, starvation, epidemic, and increased mortality.